Dr. Seuss, or Theodor Seuss Geisel (1904-1991). The Lorax. London: HarperCollins Children's Books, 2006, c1971. 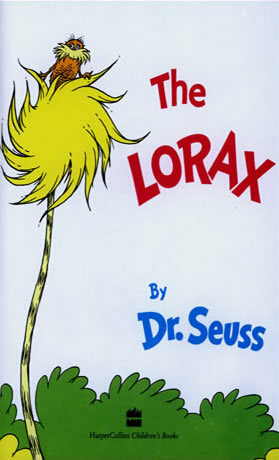 Originally published by Random House in 1971, The Lorax tells the story of the greedy Once-ler, who pollutes, deforests, and ultimately destroys the environment through his factory work. The Lorax, defender of the trees, leaves a warning to the Once-ler: "UNLESS." Seuss's work, addressing unconventional topics such as pollution in the early 1970s, was not popular when it first came out, but has become a staple of children's environmental literature today.